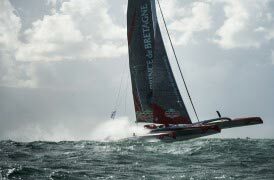 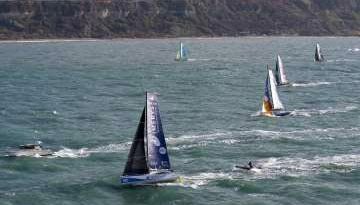 Thomas Colville and Jean-Luc Nélias on their maxi trimaran, Sodebo Ultim’ have won the Ultime class of the 13th edition of the Transat Jacques Vabre after crossing the finish line in the Bay of All Saints in Salvador de Bahia on Monday, November 13, 2017 at 10:42:27 (UTC), 7 days 22 hours 7 minutes and 27 seconds after leaving Le Havre, Normandy France. 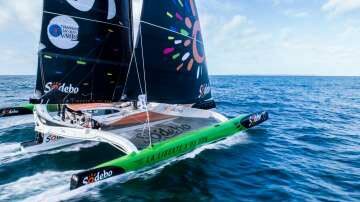 Sodebo Ultim’ sailed 4,742 nautical miles at an average speed of 24.94 knots. 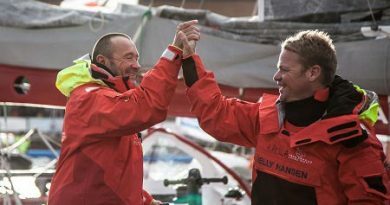 Sodebo Ultim’ beat the previous record of 10 days 0 hours 38 mins set by Franck Cammas and Steve Ravussin on Groupama 2 in the 60ft multihull class in 2007 (the last time the race finished in Salvador) by 2 days 2 hours and 31 mins.